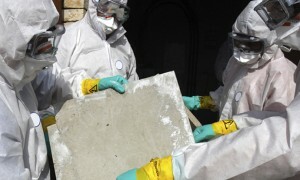 Avoid airborne asbestos contamination with expert asbestos duct removal in Altadena CA. Ductwork is one of the worst places to have asbestos, because any loose asbestos fibers can easily travel through the ducts and contaminate every room in your property. Often, the first clue people get that their ducts are contaminated with asbestos is comes from their HVAC contractor. Discovering asbestos in your ducts will bring your project to a standstill, because a specialist like AQHI Inc. must be brought in to perform the necessary asbestos duct removal in Altadena CA. Why Can’t My HVAC Contractor Provide Asbestos Duct Removal in Altadena CA? Even if your current ducts are in great shape, if they contain asbestos insulation or mastic they could present a hazard in the future. Why live with this worry? Just call AQHI Inc. for fast and effective asbestos duct removal in Altadena CA can get the problem taken care of once and for all. We guarantee to leave your property clean and asbestos-free after work. Our asbestos removal office for Asbestos Duct Removal in Altadena CA is open Monday through Friday between 8:00 AM and 5:00 PM and closed for lunch from noon to 1:00 PM. With advance notice, projects can be scheduled for weekends, early mornings and evenings.